Intermediate level course with elevated tees, baskets on hills, blind tee shots and an island green. Amenities include: BBQ pits, picnic shelters, bathrooms with AC and a cold drinking water fountain in the building by the American flag towards the end of parking lot. Open dawn to 10pm. On Stephens Road and I-94, no exit there - so take I-94 to exit 227. Go west on 9 Mile Rd for 0.3 mile to a right on Kelly Rd. Stay on Kelly for a half mile to a right on Stephens. Park is on the right in 0.4 mile. 1st tee is by the building with bathrooms. 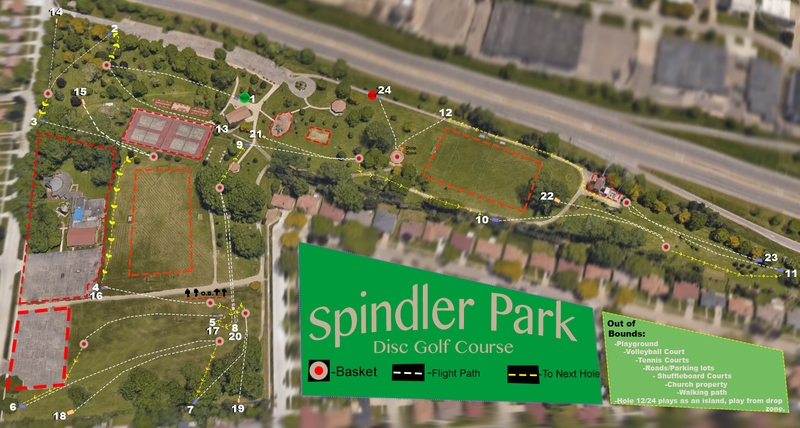 Have you played at Spindler Park? Be the first person to review this course!